Phew! It’s been a while between beer posts but not to worry, I’m still drinking beer. So much has happened since the last Hops ‘n’ Bubbles post. In particular Alberta Gaming and Liquor Commission had relaxed a few of the arcane rules that kept our provincial beer industry from flourishing and now, well…it’s flourishing. Around a dozen craft beer breweries have opened or will be opening their doors by the end of the year, with 2017 numbers looking to stretch far beyond that. I guess, that kind of news is subject for another day…but right now I want to return to an old favourite, Village Brewery and their (in)famous ‘Hump Day’ formally informal gathering of artists, farmers, brewers, food writers, dudes about town, and high falutin’ mucky mucks with at least one thing in common. The love of a good beer, and (okay, two things in common) belief in community. Once the beer starts flowing, introductions are made and the conversations start rolling. Around 3 pm, the speeches begin. Humpdays at Village Brewery always carry a hint of excitement, but this one was extra special because it was launch day for TWO new village brews and the unveiling of the Winter Variety Pack. 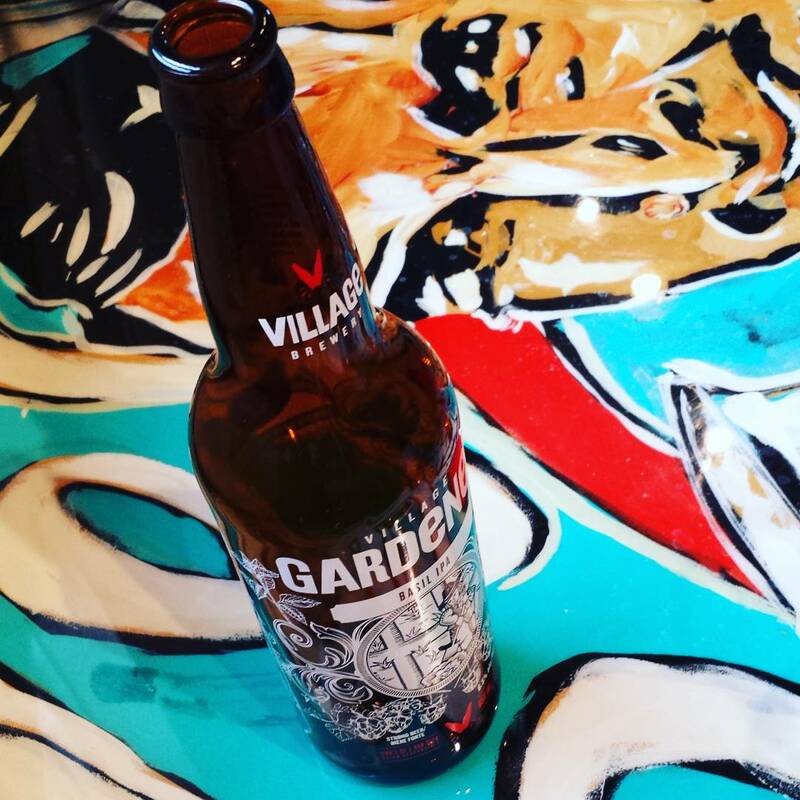 2016 marks the fourth year of the Village Gardener collaboration between local community gardens (and individual hop growing enthusiasts) and Village Brewery. It’s the ‘wild card’ of all their annual brews because no one really knows from year to year what ingredients will be used or how they will influence the flavour of the beer. This year, the brewery decided to add a bit of the green herb to the brew. Not THAT green herb… but BASIL. It was added to the fermentation stage, but removed after only two days because it was quite aromatic. Given the chance, basil can become quite overpowering but after a taste of the beer, I was really impressed by how well it complimented the IPA style. Most people think of an IPA as a summery type hot weather beer, but this one has a nice dark copper colour and some great malt flavour as well. It’s surprisingly well balanced and the perfect fall/harvest IPA. Various hops from Parkdale, Bridgeland-Riverside, Killarney-Glengarry, Inglewood, Glenmore, Wildwood, Winston Heights, Hillhurst/Sunnyside, Midnapore-Sundance, Southwood, Bankview, Grow Calgary, plus many individual growers. 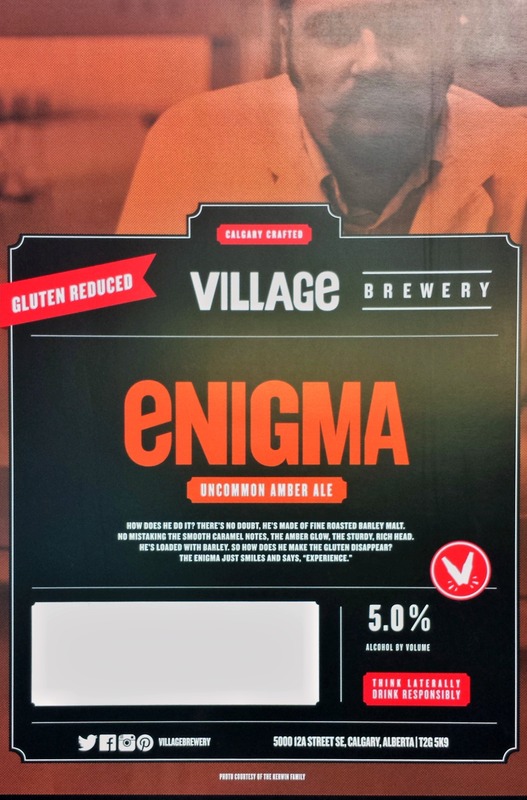 The Enigma Uncommon Amber Ale was meant to be the ‘swan song’ or ‘one of the last’ brews from Brewmaster Larry Kerwin who came to be at Village after a 40 career as a brewing beer. “The Village Enigma is an American styled Amber Ale. Rich with caramel sweetness, the Enigma hits your palate upfront. Though the sweetness is prevalent, we balance it nicely with a bitterness addition of Galena and a aromatic dry hopping bill complete with Centennial, Belma, Tahoma and Citra.” Hmmm well yes. It has a bit of sweetness and I loved the initial aromas, but for me that ‘galena’ or mineral effect really takes over. I knew it was craving a bit more sweetness even before I was told it was ‘gluten reduced’. 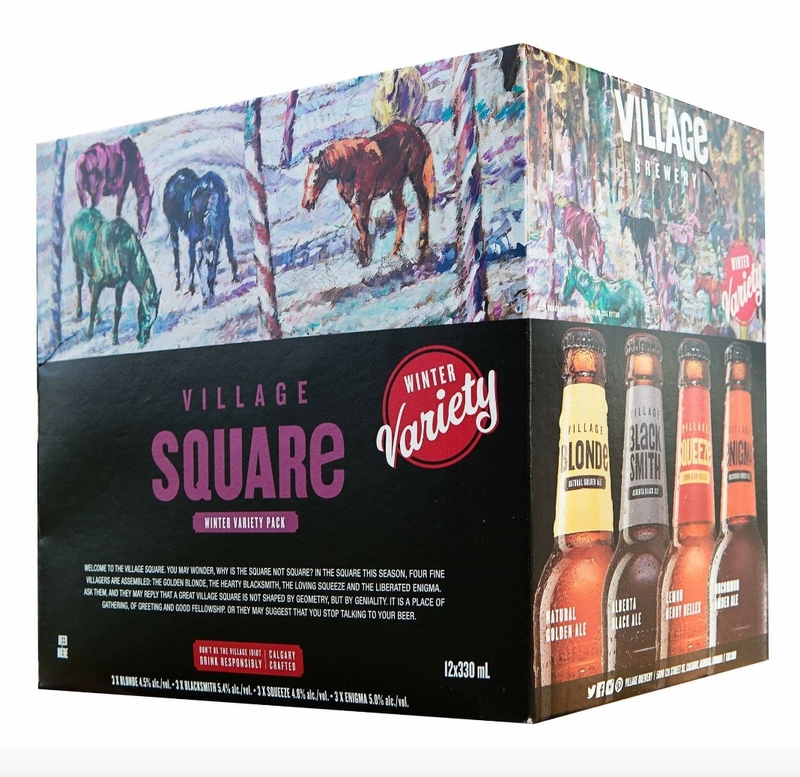 When you buy a Village Brewery variety pack, you are buying much more than beer. You are literally buying art. The box is a gorgeous oil painting entitled ‘Wild Ponies’ was painted by local artist Jack Rigaux. His Joni Mitchell inspired painting shows whimsical merry-go-round ponies moving among a sparse forest winterland. Inside, you can find four Village Brewery favourites; Village Blonde, Village Blacksmith, Village Squeeze, and the new Village Enigma. Alberta Beer Festivals has teamed up with the Brew Master Program at Olds College to offer Albertans the chance to choose a style, a name, and a design a label for their 2016 Festival Collaboration Beer. Congratulations to Christine Tonks who chose Red Ale, along with 50 % of all the beer style voters! The second contest was held to choose a name for the Red Ale. Congratulations to ‘Name It’ winner Tamara Konrad who came up with Rale Yard Red Ale. The third contest was held to design a label for the Rale Yard Red Ale. Congrats go to ‘Label It’ winner Christine Shultz who designed this wonderful label featuring a familiar Alberta scene with mountains, spruces, and a rail line. All three ladies won some great prizes and were invited to Olds College on March 9 to join the OC Brewmaster and guest brewer Graham Sherman (Tool Shed Brewery) in brewing up Rale Yard. In addition to the prizes, all three will have the chance to be a judge at the ABF in Calgary (May 6-7) and the beer will be showcased at the Old College Brewing booth at both the Calgary and Edmonton beer festivals. There will be a ‘sneak peek’ event at both Calgary locations of Pig n Duke and Beer Revolution in Edmonton when the brew is ready. As soon as I heard the conference was in Montréal, I made up a list of places to visit which included restaurants and microbrasseries. Dieu de Ciel was at the top of the list, and even though we were tired from traveling, I knew that if we didn’t go together that very night, I wouldn’t get to visit any of the great micro breweries in Montréal at all. We hopped in a taxi and arrived to a very packed pub, however, luck was on our side and we grabbed seat at the next available table in no time. We had some fun trying to decipher the menu of French beers and I didn’t realize I could have ordered a tasting trio until it was too late. Instead I got stuck drinking a whole pint of Saison de l’argousier; a seasonal brew with buckthorn berries that I really didn’t enjoy at all. I didn’t know how I was going to finish it but felt that I just couldn’t leave it there. Hubby ordered a pint of the Rosée de Hibiscus, a nice hibiscus flavored wheat beer that turned out to be quite tasty. 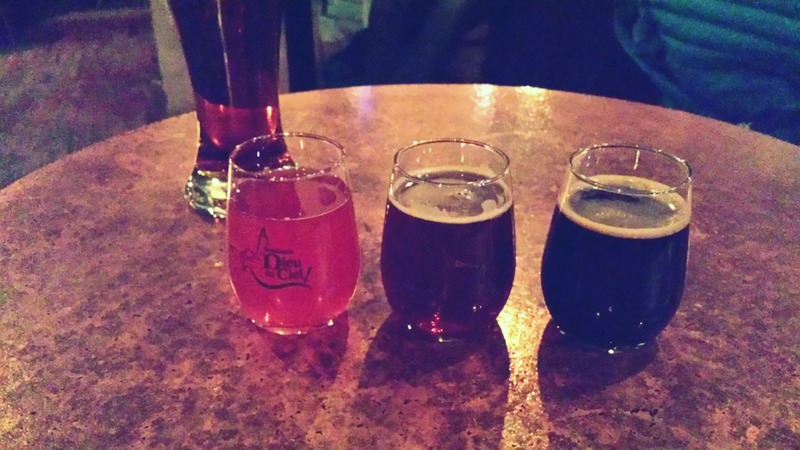 After I choked down the last of the Saison, I ordered a tasting trio; the Rosée de Hibiscus, Route de épices (peppercorn rye beer), and the Péché Mortel (imperial coffee stout). They were all delicious and I wish I could have sampled more but I had to get going early the next morning. At some point in the evening you’re bound to get hungry and Alberta Beer Festivals has that covered too. Visit some of these fine purveyors and they will suggest a dish pairing for your brew. 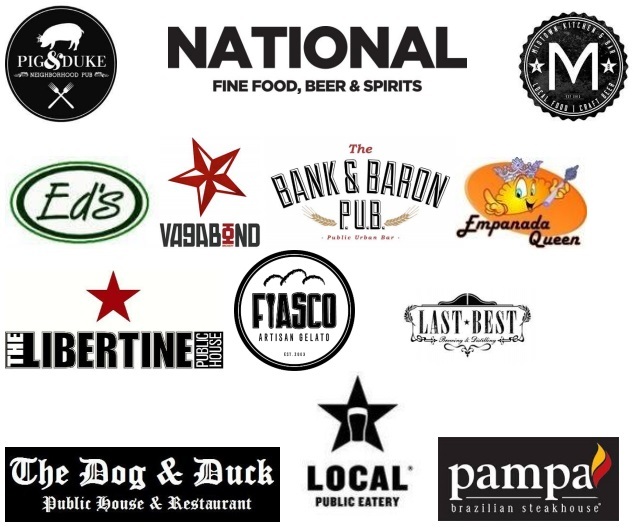 Both beer and food samples are sampled using sample tickets only (these are in addition to your ticket to the event). Sample tickets are $1 and sold in sheets of ten. The minimum amount of tickets per 4 oz. beer sample is 2 and the food generally requires a few more. Alberta Beer Festival will be supporting two charities this year; Kids Up Front ( gives donated event tickets to children and youth identified by a broad network of partner agencies that provide child and family services) and Autism Aspergers Friendship Society of Calgary (AAFS). 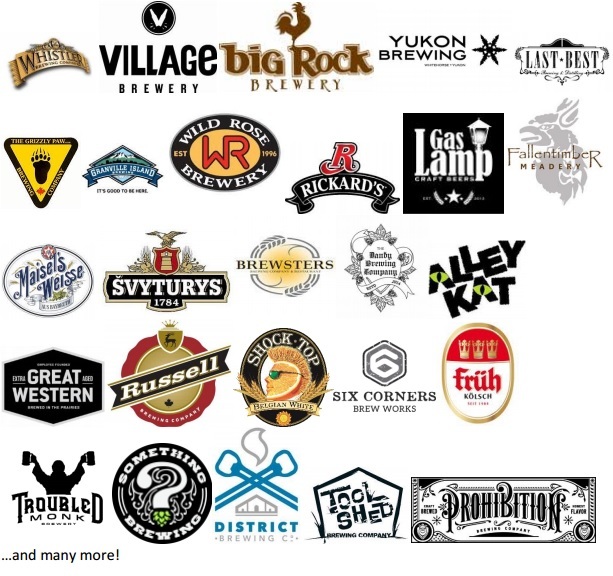 Way to be charitable Alberta Beer Festivals!!! NOTE: I wasn’t kidding about the dirndl and lederhosen…there are prizes to be won for those who come dressed in traditional Bavarian garb. Online Advance Tickets $19 Weekend Passes $30 Tickets at the door are $25 and entrance is subject to capacity. ID required. 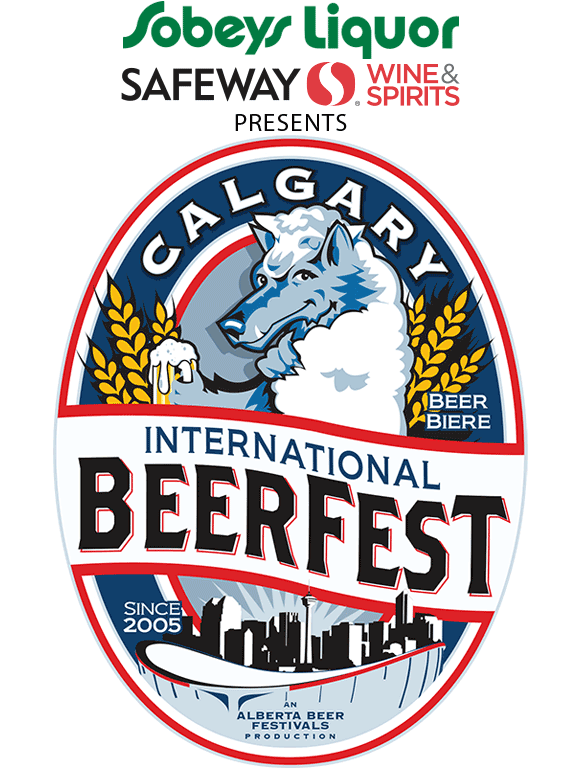 Tickets available at www.albertabeerfestivals.com and in store at all Brewsters Calgary and area locations. 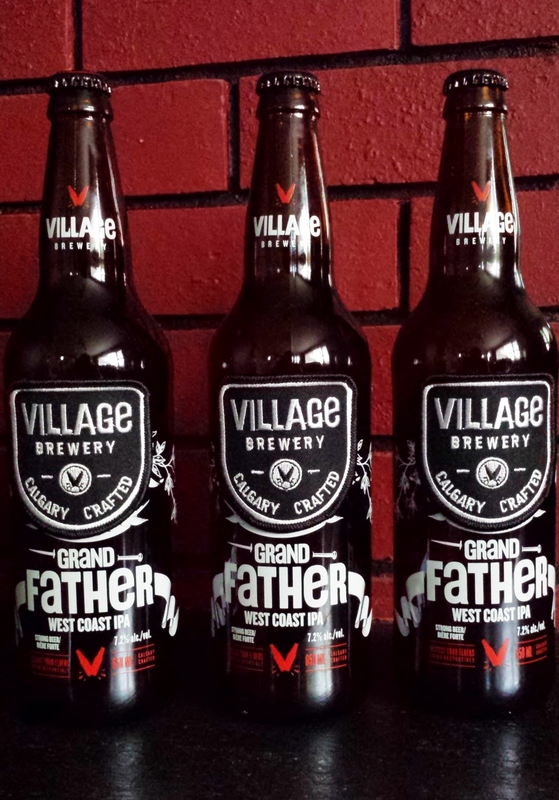 Last Wednesday Grandpa became part of the Village family during the latest humpday launch at the brewery. He was slightly bitter about it but his fruity overtones (much like his Hawaiian shirt) eventually became the essence of the brew. This beer is very technical and complicated…dammit why can’t beer can’t be the boring old horse piss it used to be? The simple answer is people no longer want horse piss, they want a beer they can study and pick apart, then enjoy it knowing that they are the master of all beer connoisseurs. The stunning golden colour appears courtesy of Canadian 2 row, Munich malts, and roasted barley. The glorious passionfruit aromas and lively tropical hop notes are courtesy of Galena, Chinook, Cascade, Centennial, Simcoe, Waimea, and Azzeca hop varietals which were added to the brew at 18 different intervals. Perhaps one or two of those are responsible for the background earthy pine aromas. This had to be one of my most favourite ‘humpdays’ yet. Village Brewery jedi Jim Button had a bus load of saucy seniors brought in to join the launch. MaryAnne and I chatted about gardening, then later Larry and I got into a serious ‘Historic Beers of Calgary’ discussion. Good times! Malt: Canadian 2 row, munich, with touches of caramel and roasted barley. Hops: 18 hop additions of Galena, Chinook, Cascade, Centennial, Chinook, Simcoe, Waimea and Azzeca. The day is finally here! Calgary International Beerfest begins today with a sneak peak event at the Libertine Public House. I can’t wait to go grab a few tastes of my favourite beverage tomorrow at the main event in the BMO Centre. With 250,00 sq feet of vendors and over 500 local and international craft beers I’m going to be a busy girl! Summer is coming and what better way to find a couple new patio beers then by trying them at Beerfest? Buy a whole stack of sample coupons and try them all, just remember to take notes or you won’t remember a thing in the morning. One way I remember is to either swipe a coaster at the sample booth OR take a photo of the beer label with my camera. That way you’ll never be left wondering what the name of that wonderful unfiltered IPA was…. Attend a Cooking with Beer Seminar hosted by Rickard’s. Learn from Calgary’s top chefs as they share industry secrets and teach you the finer points of beer pairings in a fun and friendly environment. Plus, you get to try the tasty samples that are prepared right in front of you. Tickets available at all Brewsters, Sobeys Liquor, and Sobeys Grocery stores, as well as online at Alberta Beer Festivals. OR you can win a pair of passes from me! Comment below to be entered in a random prize draw. You must be 18+ to attend. We spent Christmas on the farm so I had to get hubby to pack up the final three beers for the nights left on the advent calendar. I wasn’t going to leave them at home and miss out! We also ended up buying a Unibroue variety pack and getting my dad hooked on Blanche de Chambly. It’s probably no surprise that the Israeli beer was a let down…my dad was entirely impressed that the Quadrupel was so smooth yet so high in alcoholic content. I thought it was a superb beer to finish the calendar with.